Upon their success, the centre quickly became a haven for modern psychic development and energetic healing. Sharing their deep knowledge and experience with like-minded spiritual people, Lindsley and Tracey offer an abundance of reading, rentals and healing services within their centre as well as hosting weekly workshops, development circles, special events and courses taught by Founders and like-minded institutions. Lindsley and Tracey also exhibit spiritual special events in which, they enlighten like-minded people on the messages and guidance they have received from spirit. An example of their latest event was there, ‘Who From The Stars Are Helping In The Ascension.’ The event explored the star beings amongst us, who have come especially and specifically to help the human race raise their vibration so that they can ascend with the planet. Through received messages and channelling, they explored and spoke about the human race and about the planet and which other beings are here. With a team of Light Workers, whose spiritual consulting abilities have been vastly improved and extended since working at Clearly Destiny, they are able to deliver readings carried within the centre, sharing messages with professionalism and compassion. Their reading services include; Tarot readings, Channelled spiritual readings, Clairvoyant and Trance readings and Angelic and Astrological readings. Expanding upon their services, Clearly Destiny also facilitates a Healing Course for Lightworkers, which specialises in channelling spiritual readings. Amongst the services they provide, Clearly Destiny has their own retail shop, providing tools and materials for Light Workers, as well as shoppers looking for spiritual accessories. 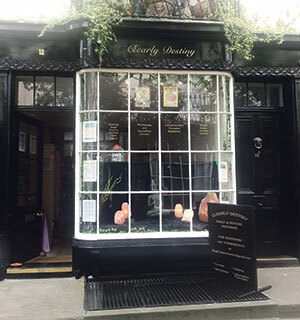 Clearly Destiny’s healing services also feature Angelic Reiki, Arcturian Healing, Cord Cutting, Crystal Healing, Massage, Past Life Exploration, Reiki, Reflexology, Soul Release, Spiritual Surgery and Bespoke Healing that is tailor made the specific needs of the customer. This entry was posted in Leisure Solutions and tagged Readings, Spiritual Services. Bookmark the permalink.